This dessert reminds me of my childhood. My mom would make this every summer and I still love it to this day. 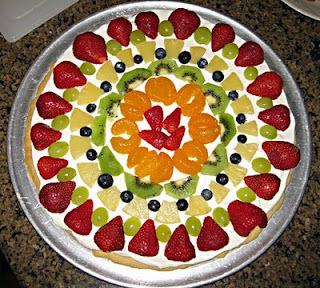 There are no rules about what types of fruit to put on top. Whatever is in season . . . whatever your family loves! For the crust, combine all ingredients. Spread out onto pizza pan and bake for 20 minutes at 350. Combine all ingredients for filling and spread onto baked/cooled crust. 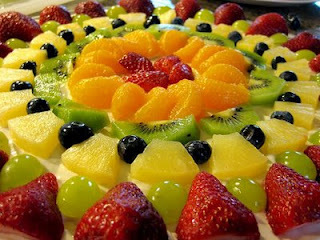 Top with fruit. Serve or keep chilled until served.